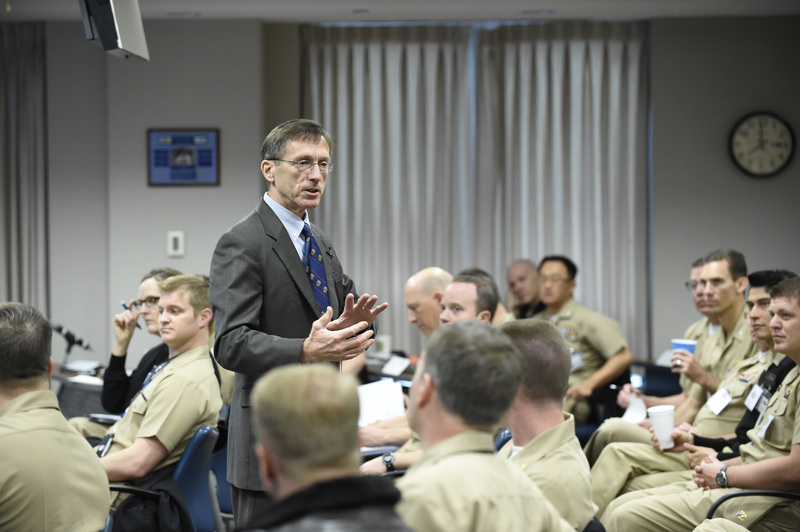 Sean Stackley, then-assistant secretary of the Navy for research, development and acquisition, addresses members of the Office of Naval Research (ONR) Reserve Component during a winter program review in January 2016. US Navy photo. The Navy’s acting secretary was tapped to lead a transition of the Defense Department’s research and acquisition office as it splits into two next year. Sean Stackley, who for more than eight years served as the Navy’s assistant secretary for research, development and acquisition, will help the Pentagon reorganize its equivalent office. The split of the current under secretary of defense for acquisition, technology and logistics – which will eventually become an under secretary for research and engineering and an under secretary for acquisition and sustainment – was mandated by the 2017 National Defense Authorization Act. Lawmakers who supported the office’s split argued that the two functions could not be appropriately led by a single head – research and engineering requires a culture that promotes innovation and risk-taking, whereas acquisition and sustainment look to reduce risk and promote stability in programs of record. Stackley’s task will be to outline subordinate assistant secretary offices and assign “authority, direction, and control of affected Defense Agencies and DoD Field Activities,” according to a Feb. 24 memo signed by Deputy Defense Secretary Robert Work. “In addition to completing the establishment of the new Offices, the plan may include options for the transfer of legacy OUSD(AT&L) functions, associated personnel, and other resources into other OSD organizations for optimal alignment, such as the Energy, Installation, and Environment portfolio,” the memo reads. Defense News, who reported Stackley’s role in the transition ahead of the memo being signed, reported that an interim report would be due to Congress by March 1 and a final report due Aug. 1, to allow the changes to be implemented by the mandated Feb. 1, 2018.